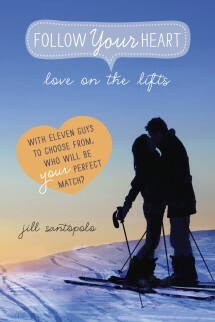 Pick your path to find a the perfect guy in this personalized romance on the ski slopes! What better way to spend your vacation than on the slopes? In this unique romance, the reader’s in the driver’s seat—creating her own path through the narrative and ending with one of eleven different guys. By making selections at the end of each chapter, the reader decides who will be her perfect match. It could be the athletic ski instructor, one of the adorable twin brothers in the lodge, or the sweet guy with the broken leg by the fireplace. Finding your dream guy couldn’t be easier, and it all takes place against the snowy backdrop of a romantic ski resort. And if not all readers are looking for love, there are other options: to hang with your sister, make new friends, or spend some time alone. But any way you slice it, every reader will have their love on the lifts! Santopolo does a wondrous job creating 11 distinctly different characters with such limited time for development, and the dialogue is snappy and creative…deliciously appealing fare for teenage girl readers.